The restart of the ALEPH server has cleared the problem that SFX was experiencing in querying the Library Catalogue – so links in SFX to ALEPH have been reinstated and confirmed as working. Please let eServices know if you experience any further problems. Posted in ALEPH, Library Catalogue, Library OPAC, RefWorks, SFX on January 31 2008 by ntucataloguing. ALEPH server has successfully been restarted by IS and all services now appear to be working fine. This means that ALEPH client, self service and Web OPAC should all be working again, but please let eServices know if you’re still experiencing problems. Posted in ALEPH, Library Catalogue, Library OPAC on January 31 2008 by Resource Discovery and Innovation Team Manager. ALEPH server Portia is experiencing a significant number of application and operating system errors. In an effort to resolve this IS need to restart the server, with immediate effect. This means that all ALEPH applications, including self service and Web OPAC will be out of action whilst the restart is taking place. Hopefully this will take about 30 minutes to complete. A technical problem with a ‘look-up’ service on the ALEPH server started to cause problems with SFX requests at around 15:45 this afternoon. ALEPH stopped responding to ‘look-up’ requests from SFX, based on ISSN and ISBN. The result was first a delay and then a time-out of the SFX service. To enable the immediate recovery of the SFX service, requests to ALEPH from SFX have been temporarily disabled. A message has been added to the SFX menu indicating that ‘SFX is currently unable to check the library catalogue for this item’ (see screengrab below). This has been done for both the existing and new installations of SFX. Searches of the Library Catalogue from RefWorks are also affected. 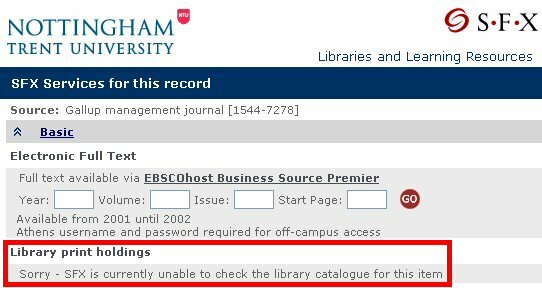 However searches carried out within the Library Catalogue, or via eSearch are working normally. An update will be provided once a resolution for this technical problem is in place and remote search services restored. Posted in ALEPH, Library Catalogue, Library OPAC, RefWorks, SFX on January 30 2008 by Resource Discovery and Innovation Team Manager. The SFX service at Nottingham Trent University has, since its launch in September 2004, been delivered through the original Tolstoy server and its successor. A persistent baseURL: the sfx.ntu.ac.uk domain has been registered independently of the Rimbaud server. This means that the domain can be reassigned to new hardware as required without needing to change any of the access URL details. So SFX links should not need to be updated during future migrations. The resolution of an Apache web server port problem: previously the SFX service was delivered through port 9003. Firewall constraints experienced by some customers in workplace or other institutional settings prevented them for accessing the service without local IT intervention. On the new Rimbaud server, SFX is delivered through the standard web port 80 (meaning that it is not necessary to include the port in the baseURL). This should resolve the remote access difficulties previously experienced by a minority of customers. Enabling a test SFX and eSearch environment: once the migration to Rimbaud has been completed, the Tolstoy server will be reconfigured to provide a complete independent test environment for both eSearch and SFX – enabling LLR to test new features, try out upgrades and pilot enhancements completely separately from the live service. To ensure that there is no interruption in customer service, both the existing and the new SFX servers will run as parallel live ‘instances’. Only when all links pointing to the SFX service have been migrated to the new SFX service will the previous service be withdrawn from customer use. The Tolstoy BaseURL of SFX is registered with several dozen online service providers. A list of the current source services of SFX can be reviewed here. Links from each of these services will be updated as part of the migration process. All other web based links to SFX services (including ‘Find it @ NTU’, Find a Journal, Citation Linker) on library and university web pages will need to be updated to reflect the change of server. The eServices team will be happy to provide technical support and advice in updating any links. A further update will be provided once the migration of SFX to the new Rimbaud server has been completed. In the meantime, please report any access difficulties to SFX services to the eServices team. Posted in SFX on January 28 2008 by Resource Discovery and Innovation Team Manager. Records for the 10 Lippincott Williams & Wilkins titles included in the JISC e-Book Observatory Project, provided through the Books@Ovid platform, have now been added to the library catalogue. Access to these titles is by Athens username and password. Posted in JISC e-Book Observatory, Library Catalogue, Library OPAC on January 25 2008 by Resource Discovery and Innovation Team Manager. The 19th Century British Library Newspapers collection contains full runs of 48 newspapers specially selected by the British Library and includes national and regional newspapers, as well as those from both established country, university towns or new industrial towns in England, Scotland, Ireland and Wales. The collection includes newspapers that helped lead particular political or social movements such as the Reform movement, Chartism, and the Home Rule movement. So-called ‘penny papers’ aimed at the working and clerical classes are also present in the collection. Posted in 19th Century British Library Newspapers, British Library on January 25 2008 by Resource Discovery and Innovation Team Manager.